Heading to the beach in the summer is a childhood rite of passage. I spent most of my summers as a child on the many beaches along the Ottawa River with my family. We went boating just about every weekend! Fast forward to today and many families venture to local beaches over summer vacation. Oceans, rivers and lakes are free places for children to splash, play, build sandcastles, or just relax. It’s important to think ahead and take extra safety precautions to prevent and/or be ready for any situations. 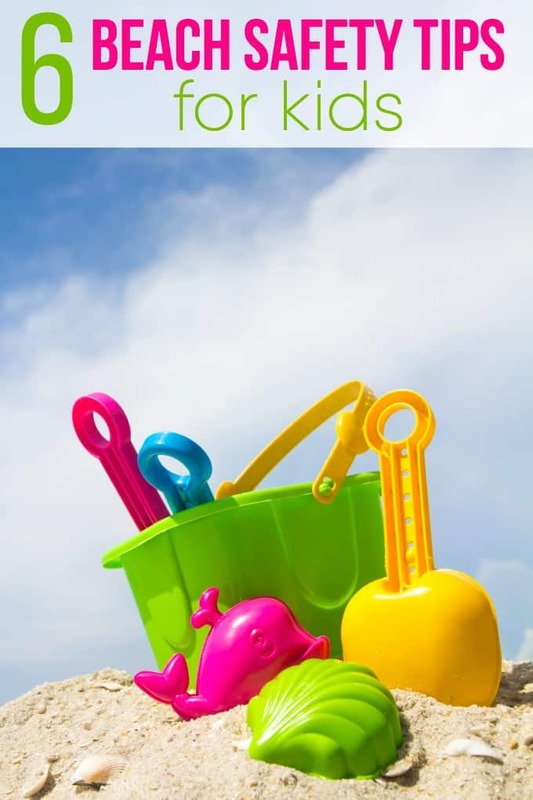 Follow these six beach safety tips for kids so you and your family have a great day at the water! 1. Always obey the beach safety flags. Beaches use flags to warn visitors of dangerous conditions. A green flag means the conditions are calm and it’s okay to swim. Yellow means there is some light surf or currents and caution is advised. Red means there is very strong surf or currents so it’s not recommended that children get in the water. Double red means the beach is closed to the public. There is also a purple flag when jellyfish and other dangerous marine animals could be present. 2. Wear life jackets. Young children should wear an approved life vest when in the water. Even if they are only walking in water up to their knees or waist, the waves could cause them to lose their footing. It’s important they wear a flotation device so they can stay above water until an adult can help. 3. Only swim in safe areas. Not all areas of the beach are safe for kids to splash or swim in. Studies have found that beaches with no lifeguard around create a much greater risk for drowning. Find a public location with a lifeguard present. That way, there is help available if something should go wrong. 4. Protect everyone from the sun. Most beaches don’t have many shady spots so carry a beach umbrella for the family to sit under during a break from the water. Apply sunscreen on the children and reapply as needed to ensure they do not get burned. Take a cooler of cold water to keep children hydrated as well. 5. Wear shoes on the sand. Many kids will want to feel the sand beneath their toes as they run to and from the water. However, in the hottest part of the day, the sand can get very hot. It can be too hot to walk on it with bare feet. Bring beach shoes or flip flops to keep everyone’s feet comfortable and protected. 6. Never dive into the ocean. Most places you will swim at the beach is not deep enough for diving. Avoid head or neck injury and splash into the water feet first. Do you have any other beach safety tips to add?